I love taking walks, and with the increased temperatures and increased daylight, I’ve been on a lot more of them. It makes me so happy to be out in my neighborhood on a regular basis, soaking in all of the new greenery. Seeing the tiny leaf buds on the trees unfurl into fresh green leaves is one of my favorite things EVER! And with warm-weather season comes running season! I’m not about to make it seem like I’m a runner; I do a few 5K races every year, and my pace during those is more like a slow-jog than a runner’s stride. Still, it’s fun to get out there and try another variety of exercise, even if I pretty much feel like I’m slogging through Jell-O two miles in (slogging through Jell-O is better than stopping, right?). 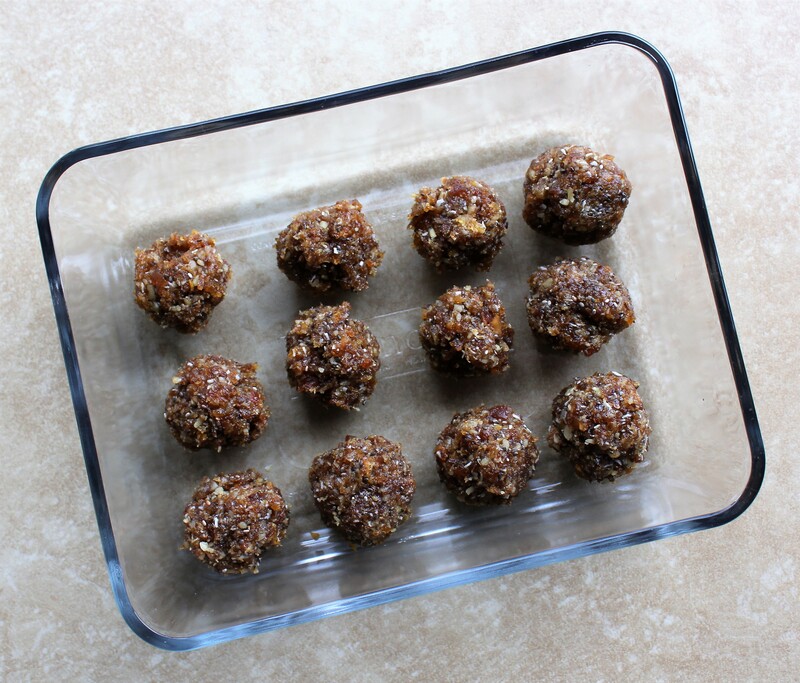 The reason I bring up running is because I feel like these Apricot-Date Energy Balls are the perfect runner’s snack. The dates, dried apricots, and unsweetened dried coconut flakes in them are excellent sources of nutrients and natural sugar (hello, energy! ), as is the honey – especially if raw honey is used (it’s a powerhouse, infused with vitamins and minerals and said to be antibacterial, antiviral, and antifungal. I love the Madhava brand’s Organic Pure and Raw Honey). Walnuts pack the protein, and chia seeds – those mighty little guys! – are loaded with protein, fiber, antioxidants, and vitamins and minerals such as calcium, manganese, and magnesium. 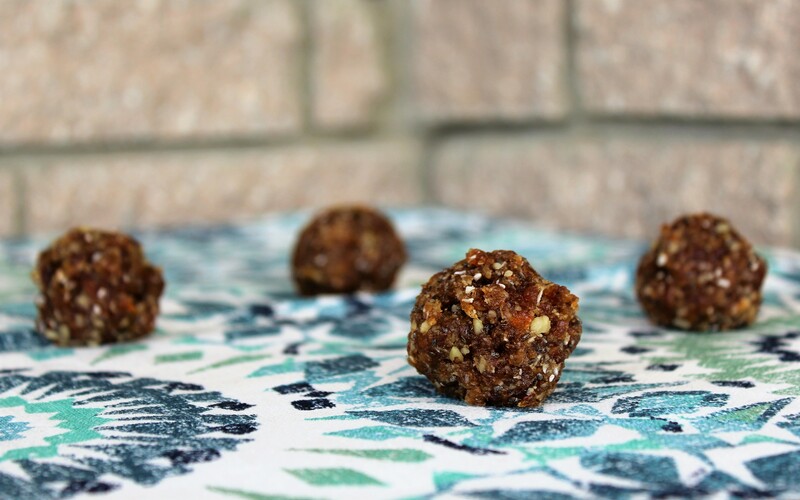 This is my first foray into the energy-ball realm, but I knew I would love them when I saw that most energy balls use dates as their base ingredient. Dates are my JAM! I love how naturally sweet they are, how excellent they are dipped into natural peanut butter (try it – your mind will be BLOWN! ), that they improve digestion, and that they’re loaded with goodie vitamins and minerals such as potassium, copper, and Vitamin B6. Date-infused, naturally sweetened treats have been my life-saver as I’ve worked to drastically cut the amount of processed sugar I consume. I haven’t missed the birthday cake and just-because donuts perennially lying around my day-job office with these Apricot-Date Energy Balls having my back! They’re a reminder that fruit IS the O.G. of dessert foods. A helpful tip: when looking for dried apricots, try to choose those that have no additional ingredients added – no sulfur dioxide, processed sugar, etc. Unsulphured apricots will look dark in color – dark brown or almost black – without the sulfur dioxide helping them maintain that bright-orange hue. But they will taste fantastic! OK, on to the recipe and naturally decadent deliciousness + energy!!! 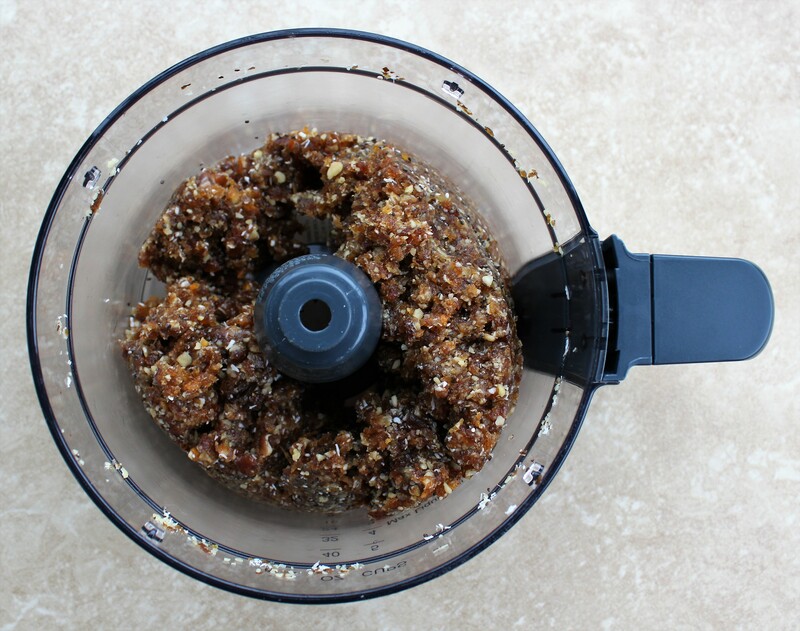 Add the dates, apricots, and walnuts to a food processor or blender and pulse until well chopped. Add the remaining ingredients and processed until well-blended. Form the dough-like result into balls roughly one inch or so in diameter. And you're done! You have delicious energy balls to enjoy! As you'll notice when forming them, they'll be sticky at first, but if you store them in the fridge they'll become less so.